Take a trip down to Asia and enjoy the most popular food that they have, Sushi. Sushi is taking the entire world by storm as millions of people are starting to take on that trend and it became the most favored food for them as well. This game is themed around Sushi and it invites players to go on Sushi hunting adventure as they go from one Asian country to the other eating sushi on board the Sushi Express. This is why players will see plenty of Sushi symbols on the reels of the game as well as a Sushi dominated interface. Play Sushi Express here. On top of the 5 reels of the slot, players will see a huge purple Octopus Sushi chef with a Tako band on his head and the reels themselves are located inside of his sushi restaurant. As for the symbols that spin on the 5 reels and the 30 lines of the game, they include delicious Sushi samples that we all love and enjoy. So get ready for one heck of at tasty and a high paying slot gaming experience where you can spin the reels, enjoy the food presented by the Octopus Chef while having a chance to win great rewards including the ever increasing progressive jackpot of the slot. Since the game is backed by Cryptologic then players can automatically assume that they are in for one heck of a visually entertaining and an immersive gaming experience. The symbols include the famous Soy Sauce, the Bonus Fish symbols, Tako, Sushi, Crabs, Asian herbs the Sushi Octopus Chef and much more. The slot machine’s bets are placed, like any other slot, at the bottom wagering panel where players can view the different betting options so they can specify how much they want to place for each spin. These options include the number of paylines as well as the coin value that players wish to use. 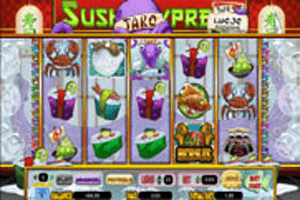 The current amount of the game’s progressive jackpot is found on the top right corner where players will see a tips jar that has the word progressive on it with the amount of the jackpot which is usually above one million. Even if players did not trigger the jackpot, they can still earn great rewards through the regular line payouts through which they can earn up to 1000 coins when they get 5 octopus chefs on any of the 30 paylines of the game. Other symbols pay from 5 to 500 coins. Players can view the different pays through the paytable of the game. It will also show them that the Octopus Chef is the wild icon of the game that can substitute for any of the other symbols for a chance to help players create a payable combo of sushi. There is also the Bonus Fish icon which is a scatter icon. Three of these scatters anywhere on the reels will trigger the Pick Your Plate bonus round where players will choose one of many dishes for a chance to earn multipliers, free spins or even hit the growing progressive jackpot.